The Georgia Southern Eagles come into Las Cruces at 3-3, 2-1 in Sun Belt play. They’re averaging 30.3 points per game while holding their opponents to just 23.5 points per game. While Georgia Southern is trying to pass the ball more this season than in the past, they’re still primarily a running team with just over 75 percent of their play calls resulting in a run compared to 84 percent of their play calls last year being runs. The Eagles are averaging around 266 yards per game on the ground, nearly a 100 yards fewer than last season. However, Georgia Southern is averaging just over 155 yards per game through the air which is nearly 100 yards per game more than they were last year. Defensively the Eagles are allowing just 364 yards per game, 153 on the ground and 211 through the air. A couple of numbers really stick out with Georgia Southern. First, they’re converting 50 percent of their third down situations which leads the Sun Belt. Second, they’ve converted 87.5 percent of their red zone trips into points (21 of 24) and lest you think that it’s just good fortune, they converted 87.5 percent of their red zone trips last season and just a shade over 88 percent of their trips in 2014. Let’s take a closer look at Georgia Southern in our weekly deep dive. It’s not going to be too complicated to figure out what Georgia Southern is going to do based on our above observation of their play calling. On first down the Eagles will run the ball the majority of the time. They’ve run the ball 165 times on first down while gaining 843 yards, an average of 5.11 yards per carry. When they have decided to pass the ball on first down, they’ve only completed 18-of-37 passes (48.6 percent) for 174 yards, an average of 9.67 yards per completion. As we mentioned, the Eagles are highly efficient on third down converting right at 50 percent. As one would expect, Georgia Southern is deadly on third and short (1 to 3 yards to gain) converting 20 of their 25 third and short situations with 19 of those conversions coming on the ground. When it’s third and short, expect the Eagles to run the ball and if you get a stop, consider it a huge win for the defense. On third and intermediate (4 to 6 yards to gain) it’s a little dicier for the Eagles. They’ve faced that situation 24 times but converted just nine times, five times on the ground and four times through the air. They’ve run the ball 13 times while throwing it 11 times (completing five of those passes). On third and long (7+ yards to gain) the Eagles have attempted to pick it up on the ground 21 times but have come away with just three first downs. They’ve had a bit more success through the air attempting 22 passes and converting 11 of the third and long situations. If the Aggies can get Georgia Southern into third and long situations, they should be able to get off the field more often than not. Defensively on first down teams have tried to run the ball on the Eagles 65 percent of the time (111 attempts). Their defense is allowing 4.51 yards per carry on first down while allowing opponents to complete 35-of-61 pass attempts for an average of 16.8 yards per completion. On third down, teams have not had as much success against the Eagles converting just 31 percent of the time (22-of-69) and it’s even worse if you’re a Sun Belt team. The Eagles have held Sun Belt foes to just a 24.3 percent conversion rate (9-of-37) in three games. On third and short (1 to 3 yards to gain), teams have attempted 13 runs, they’ve picked up seven first downs. Surprisingly nobody has attempted to throw on Georgia Southern on third and short. Third and intermediate (4 to 6 yards) is absolute death if you’re an opponent. Teams have tried to run the ball 12 times and have done so for -25 yards and have only picked up one first down. You’re not much better off throwing the ball either as teams have thrown on third and intermediate nine times completing five passes but picking up just four first downs. It would appear that the Eagles send extra defenders on third and intermediate based on the rushing numbers, although they’ve only recorded seven sacks on the season. On third and long (7+ yards to gain) teams have basically avoided running against Georgia Southern. Just four rush attempts and no first down pickups. Teams have throws the ball 31 times completing 15 pass attempts while picking up just seven first downs, six of those first downs coming on third and between 7 and 9 yards to gain. One final note. As bad as the Aggie defense has been they’ve not given up a run of more than 30 yards in conference play and just one of 20+ yards, although against Georgia Southern’s defense that will be tested. Georgia Southern on the other hand has given up six runs of 20+ yards and one each of 30+, 40+ and 50+ yards. There is the possibility that Larry Rose III could break a long run, something he has yet to do since his return to the Aggies. The bottom line for today’s game, the Aggie offense is going to have to do some work. They’re going to have to sustain drives, try to stay out of third down situations when possible and try to get some explosion plays. For as good as Georgia Southern’s defense has been this season, they have been susceptible to giving up the big play. In Sun Belt play they’ve given up 14 pass completions of 20+ yards, seven completions of 30+ yards, two completions of 40+ yards, two completions of 50+ yards and one pass completion of 60+ yards. Compare that with the Aggies who have given up 12 completions of 20+ yards, six of 30+ yards, four of 40 plus yards, three of 50+ yards, two of 60+ yards and one of 70+ yards. The big difference is that the Aggies have given up a few more of the longer pass plays than has Georgia Southern. We know the defense will give up points, the question is, can the offense keep up? 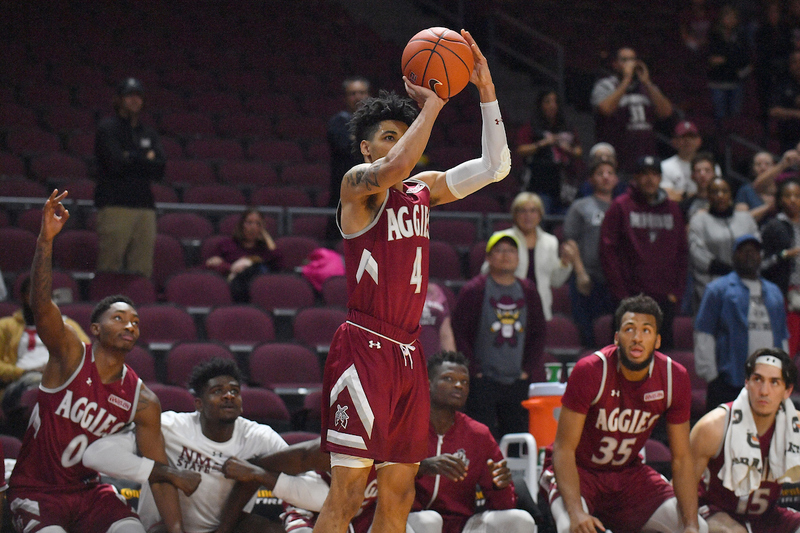 For the second time in as many seasons the Aggies are coming off an embarrassing loss against Troy. They’ll be looking to bounce back against UL Lafayette and last year the Aggies went to Lafayette and came away with a victory. It’s time once again for a deep examination of the numbers behind the two teams. When the Aggies have the ball they should have success passing the ball agains the Ragin’ Cajuns. On first down, teams have thrown the ball 53 times completing 35, good for 66 percent but more importantly, teams have had success moving the ball in large chunks on first down against the Cajuns. Of those 35 completions, 13 of them have been for 15+ yards and seven have been for 25+ yards. Likewise on second down teams have found great success against this Cajun defense completing 32 of 47 attempts, picking up 19 first downs with 10 pass completions of 15+ yards and four more of 25+ yards. Suffice to say, the Aggies will look to exploit that because it has not been easy for teams to run the ball against ULL this season. Teams have attempted to run the ball 83 times on first down gaining 305 yards (3.67 yards per carry). They have given up nine runs of 10+ yards and one run of 20+ yards but the other 73 times teams have run the ball, their average gain is less than three yards per carry. ULL is stout against the run on third down. Teams are averaging a paltry 0.68 yards per carry on third down and teams have converted just three times on the ground out of 25 third down rushing attempts and if you get into a third and long situation (seven or more yards to gain) forget about it. Outside of one 16 yard run, teams have attempted 10 other runs on third an 7+ yards and run for a grand total of -2 yards. If the Aggie offense is going to stay on the field, they’re going to have to convert third downs through the air. That’s where the ULL defense is vulnerable, particularly on third an between 7 and 9 yards to gain (an area where NMSU has excelled this season converting 7-of-15 times they’ve faced that situation). ULL has allowed six first down conversions of the nine third downs where teams had to gain between seven and nine yards for first down and likewise have allowed six first downs on 11 of the attempts where teams had to gain between four and six yards. In fact, you don’t want to get into a third and less than three or more than 10 situation against ULL. They’ve allowed just six first downs in the 32 times that particular situation has arisen (just under 19 percent of the time or one out of every five times). Third and short yardage (1 to 3 yards) will be interesting because the Aggies have converted 10 of the 14 times they’ve had third and between one and three yards to gain). Those third down situations where teams have had to gain between four and nine yards, they’ve converted 12 of 20 times through the air but NONE of the seven times on the ground. Again, the Aggie passing offense looks to have to carry the load this week so it will be a good opportunity for Tyler Rogers to bounce back from his atrocious five interception outing against Troy. When ULL has the ball on first down, they’ve run the ball 75 times averaging 4.41 yards per carry with nine runs of 10+ yards and three more of 20+ yards. They’ve been very good through the air on first down completing 34 of 50 attempts for 391 yards, however, what should really concern the Aggie defense is nearly half of those completions have been what the coaching staff deems as “explosion” plays. Ten times ULL has completed a pass on first down for more than 15 yards and five more times they’ve completed a pass for 25 yards. When opposing defenses have gotten ULL to third down, they’ve done a good job holding them to just 23 first down conversions out of the 67 times they’ve faced that situation. They’ve converted 21 conventionally and twice through a defensive penalty. Today’s game will be interesting. Clearly the Aggies feel the need to throw the ball to open up the run game, similar to what they felt against Kentucky and in that game it worked, they ran 45 times for 223 yards and averaged nearly five yards per carry. However, against UNM and Troy the Aggies ran almost 70 times combined and averaged under three yards per carry. Teams have tried to run the ball quite a bit against ULL and have not found much success as they’re allowing just 2.79 yards per carry and just 2.38 yards per carry in the past three games. A healthy Larry Rose III would have been an intriguing matchup against this stout run defense of ULL. Unfortunately Rose is anything but fully healthy as he continues to come back from his sports hernia surgery and after suffering a groin injury in last week’s game against Troy, you have to wonder how effective he’ll be against ULL. If the Ragin Cajuns force the Aggies to have to pass the ball to gain yards, it could be another long day for Tyler Rogers and the Aggie offense. 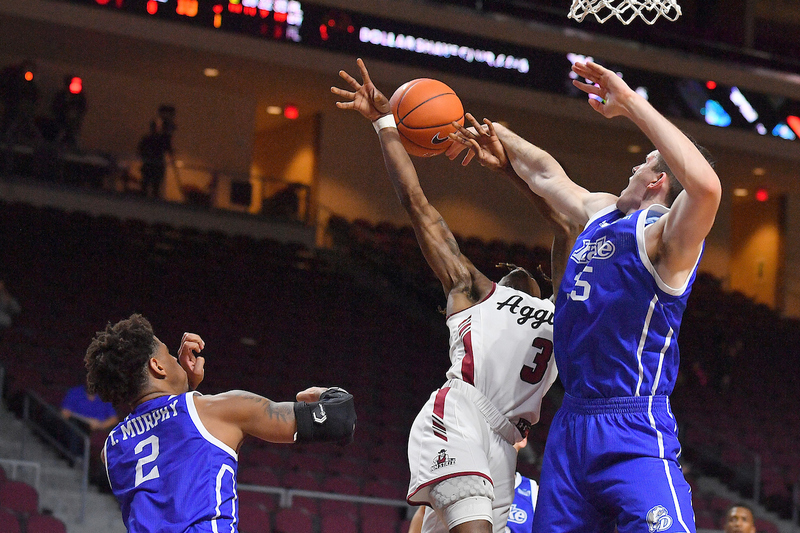 If the Aggies and Larry Rose III can find some success on the ground, similar to what Boise State had in the opener, the Aggies will have an great shot at winning the game.